Gerber Products Company is recalling Gerber Good Start Gentle powdered infant formula in 23.2 ounce plastic packages, according to a statement released by the US Food and Drug Administration. Gerber said that the infant formula can be identified by its batch number and expiration date – batch: GXP1684, expiration date: March 5, 2013. 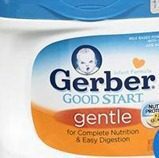 Shoppers who have bought Gerber Good Start Gentle powdered infant formula with that batch number and expiration date are being asked to call Gerber for a replacement. The company offered a 24 hour phone number for replacement requests or questions by parents or caregivers. The number is 1-800-487-7763. Gerber did say this recall is limited to only this one product, batch, and expiration date. No other Gerber Good Start products are involved in the recall.